Want to give a little something to a lot of people—and not break the budget in the process? You can—with more than 200 unique, value-priced clothing items + home accessories in the Hymnscript Collection. 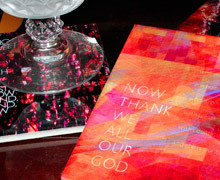 From top-quality Hanes® Beefy-T® shirts to dishwasher-safe beverage coasters, you’ll surely find a fresh, hymn-infused way to thank or inspire your favorite bunch. Your art work is lovely. I bookmarked your page—the work is stunning, and your items would make excellent gifts for fellow church musicians. I would like to purchase poster prints of your work to hang in the rooms of the music suite of our church. I know they would be a huge blessing to our ministry.